William B. Ricketts Jr., known as JR, 49, of Pawhuska, OK passed away on Saturday, September 27, 2014 at the OU Medical Center in Oklahoma City, Oklahoma after a lengthy illness. He was surrounded in death by his closest family and friends. He was born to Mary Elizabeth Hopper Ricketts and the late William B. Ricketts (Blackie) on March 27, 1965 in Tulsa. JR graduated from Pawhuska High School, attended Oklahoma State University and graduated from the University of Central Oklahoma in Edmond. 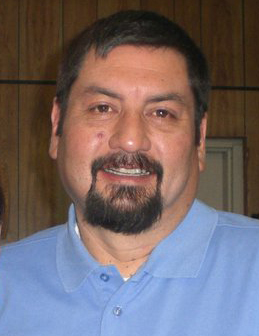 JR was the Director of the Osage Nation Membership Office for many years in Pawhuska. He formerly worked for Advanced Financial Solutions (AFS) as a Banking Software Specialist in Oklahoma City for approximately 15 years. JR loved to travel and it is no surprise his career took him all over the world. If he wasn’t traveling for his profession he was still off on many travel adventures. He also loved music, fine dining and cuisine. He was a member of the Immaculate Conception Church in Pawhuska. He was of Osage Indian descent and a member of the Osage Nation. Osage Chiefs and Tribal Leaders from across Indian Country considered JR a friend. A former Osage Chief trusted in his abilities and sent him often to represent him and the Osage Nation throughout Indian Country for committee meetings and conferences. Former Chief Jim Gray said it best by describing JR as having the humor of his father, Blackie, and the heart of his mother, Liz. JR was so loved by many and wherever he went laughter followed. JR is survived by his mother Mary Elizabeth Ricketts. His Uncle and Aunt, Mr. and Mrs. Walter and Marilyn Hopper of Tulsa, and his Aunt Julia Lookout of Pawhuska. He had many close friends and family who traveled from all over the country to honor him in his final days on earth. JR was brought home to lie in state on the family ranch. A rosary was held Sept. 29. Indian Services were conducted by Mongrain Lookout at the home and a Catholic Church Service by Father Chris Daigle followed. Interment was at the Pawhuska Cemetery. A traditional Osage meal was served. His mother and family wish to thank everyone for all their prayers and flowers honoring JR. He was a blessing to all our lives.